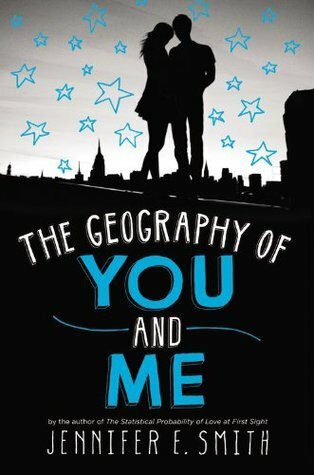 The Geography of You and Me is not your typical YA contemporary romance novel. It has a lot more to it than you would originally think based on just the cover, synopsis, and title. Jennifer E. Smith has a way of making something that seems like it would just be a lighthearted romance into something so much more. The Geography of You and Me tells the story of Owen and Lucy, two very different people from very different lives who meet one night while stuck in an elevator. Their meeting is innocent enough and their relationship continues that way. They spend very little time together in person but even when they move away they continue to talk through postcards and emails. Life doesn’t stop just because they can’t be together and they continue on with their lives like normal. The story is the evolution of their relationship from that one night together to many months spent on separate continents to finally being reunited. However, it’s also both their journeys to finally find a place to call home. Lucy and Owen are both kind of awkward in a really cute teenager way. Owen has lost his mom and it’s just him and his dad now. They don’t have the most conventional relationship but it works for them. They spend a lot of time traveling, looking for work and a new place to call home. Lucy is a loner who never really fits in anywhere she goes. Whether it be New York or Scotland, there is always something that keeps her from settling down. Throughout the course of Lucy and Owen’s relationship they both spend a lot of time working out family issues as well as becoming comfortable with themselves. Like I said, there was a lot more to the story than I originally thought. The pacing is the only reason I didn’t give this book 5 stars. It took me a while to get into Lucy and Owen’s story and even after I was interested, I still didn’t make a lot of progress with the book. Things just didn’t seem to go anywhere for quite some time. I know the book is contemporary and that sometimes means that it won’t be super fast-paced but I expected a little more from this one. That’s not to say I was bored but I didn’t find myself completely hooked. Overall, The Geography of You and Me is another great book from Jennifer E. Smith. I’d definitely recommend this one if you are looking for an enjoyable contemporary read for a rainy day. I find that most of her books have that extra layer of depth, like she’s put so much more into them than a wonderful romance. That’s what I love about her books. I’m happy that they’re both awkward and real teens, as opposed to these boys who are so polished and smoothed and great at flirting. Never met those guys in a real high school!! I agree so much – about how Smith takes these books that seem like they’re going to be easy and light, and gives so much more to them. And I also felt similar about how the placing was a bit too slow. I liked this, though, but I wasn’t madly in love. This is on my to-read list! Hoping I enjoy this a little more than you did since I like slow reads (though not boring ones!) I remember being disappointed by The Statistical Probability of…praying that won’t be the case here. Thanks for the review!! This sounds like a fresh take on “star crossed lovers.” Glad you enjoyed it. You know, I tried to read a Jennifer E. Smith book, but I just couldn’t get into it. I loved the characters, I loved the storyline, but I just felt like it was missing an extra something to keep me going. I know I am the only weirdo who thinks this about her books, though! lol. Haven’t read any of her books yet but looking forward to reading this one. The characters sound more real. Glad you enjoyed it though it’s a shame about the slow pacing. I’m glad you enjoyed this one!! I definitely agree that there was something that kept me from fully loving the book and being invested in the characters. I think for me, it had more to do with how the story was told rather than the pacing. Although – now that I’m thinking about it, it was probably a combination of the two. I wonder if it’s the voice? Was it not authentic?